After the long, dark, wet winter we have all battled through, spring could not be more welcome. However, while most of the country prays for long, sunny days, up to 20pc of the country will be dreading them. Hay fever sufferers now make up almost one fifth of the population and, for them, spring and summer can be very difficult to manage. Rain brings relief to those suffering the effects like sun does to those with Seasonal Affective Disorder (SAD). It makes you wonder why hay fever sufferers from sunny climes don't all move to Ireland. Plenty rain to go around here. My son suffers from the allergy and came home on Sunday from playing football on a freshly mowed grass pitch with red, itchy eyes and a bout of sneezing. It seems that, despite the still-cold temperatures, hay fever is kicking off. Hay fever - or 'seasonal allergic rhinitis', to use the medical term - is an allergic reaction to pollen and spores. These are found in the microscopic grains that plants, trees, grasses or fungi use for fertilisation. In spring, plant life comes into bloom - and trees, grasses and flowers release pollen and spores in order to reproduce. While many plants rely on insects to transfer their pollen, others release their pollen on the wind. It tends to be this wind-borne pollen that causes problems for people with allergies. 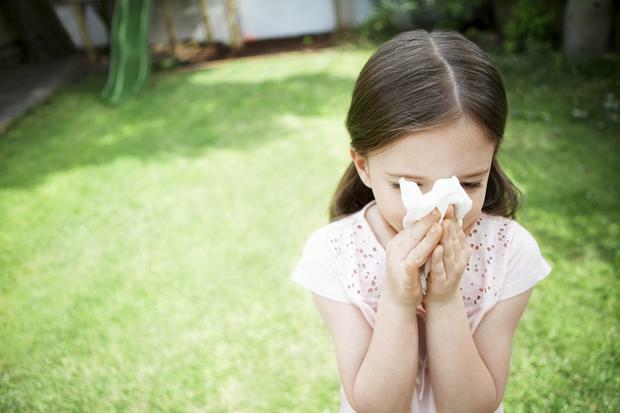 In Ireland, grass pollen is the most common allergen and up to 90pc of people with hay fever are allergic to it. This spring is set to be even tougher for hay fever suffers according to Dr Leo Galland, a UK leading global expert in the treatment of allergies. He says that spring is set to deliver a potent new mix of 'super-allergens' that stem from a combination of global warming, increased air pollution and potent irritants lurking in our homes. Studies certainly point to the fact that air pollution is contributing to the problem. Research carried out in Sweden, Italy and Spain has shown that hay fever rates are greater in cities than in the surrounding rural areas, where pollen counts are actually higher. Additionally, studies in Japan found that the highest incidence of hay fever was in populations living alongside busy roads. "City dwellers do seem to suffer worse because of the combination of pollen and diesel fumes, which can make life especially hard for them," says Dr Paul Carson, a Dublin-based GP who specialises in the treatment of allergies. The worst type of weather for hay fever sufferers is a hot, sunny day with light winds and no rain. So those rare, perfect summer days in Ireland are a disaster for people suffering from the allergy. Time of day also has an effect. In towns and cities, the evening is the peak time for pollen, whereas in the countryside the afternoon is the worst time of day for sufferers. Rain offers relief to people with hay fever because it washes the pollen out of the air. Rainfall in the morning will nearly always keep the pollen count down to low or moderate for the rest of the day. If rain is the solution, it makes you wonder how in the world anyone in Ireland could possibly have hay fever. Do the poor sufferers have to follow rain around and avoid sun altogether? Thankfully not. The beach is the answer. The clean air blowing in from the sea provides those affected with welcome relief. Thank God for that, or you'd end up walking around under an umbrella all day with a ghostly pallor from lack of sunshine. So all those years our grannies told us about the importance of fresh, sea air - it turns out they were right on many levels. Other ways to help with hay fever are to avoid cutting grass, playing or walking in grassy areas, and camping. However, this is clearly almost impossible to manage during the summer months if you or your child want to be outside at all. Besides, no one wants their garden becoming a jungle of uncut grass and weeds either. Easier advice to follow is to wear wraparound sunglasses to stop pollen getting in your eyes when you are outdoors. Also recommended is to change your clothes and take a shower after being outdoors to remove the pollen on your body. Another tip is to avoid having fresh flowers in the house and hoover regularly. Dust with a wet cloth, rather than a dry one, as this will collect the dust and stop pollen from being spread around. For those with pets, try to keep them out of the house during the hay fever season. If your pet does come indoors, wash them regularly to remove any pollen from fur. My black cat is not going to like that tip. Who knows, maybe the awful weather here is due to all the hay fever sufferers doing rain dances? Who could blame them? A summer of itchy eyes, sneezing, runny noses and scratchy throats is no fun for anyone.